Wales international David Brooks opened the scoring before King converted a spot-kick - Christian Kabasele was sent off for conceding the penalty - and he added a third with a well-placed header from Callum Wilson's cross. The Cherries scored a fourth early in the second half when Wilson flicked over Ben Foster from close range to seal a miserable afternoon for Javi Gracia's side. Watford had a flurry of early chances but it was Brooks who opened the scoring for the visitors in the 14th minute, against the run of play, for his second goal in two games. King raced down the left, picking out Wilson, who forced a fantastic save out of Foster before the 21-year-old burst forward to put the ball into an empty net. The Hornets wasted a golden chance to level the scoring soon after, with Jose Holebas picking out Craig Cathcart from a corner, but the unmarked defender blazed his free header well wide. The key moment of the match came when Kabasele was shown a second yellow just after the half-hour mark - when he pulled down King inside the box - and the Norwegian sent Foster the wrong way from the resulting penalty, slotting into the bottom-right corner. 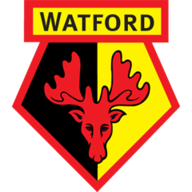 Watford's only change saw Kiko Femenia come in for Marc Navarro at right back, while Gerard Deulofeu returned to the bench, looking to make his first Premier League appearance of the season. Bournemouth, meanwhile, stuck with the same XI that beat Crystal Palace on Monday. Ex-Liverpool winger Jordon Ibe replaced young striker Lys Mousset on the bench. 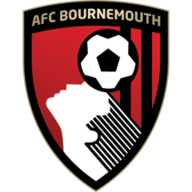 Bournemouth began to dominate with their one-man advantage, and after Brooks fed Wilson down the right, the striker found King inside the box, who headed past Foster for his second and the Cherries' third in the 45th minute. Wilson confirmed Bournemouth's record top-flight away win just two minutes into the second half when he flicked over Foster from Ryan Fraser's cross on the left, and the Cherries cruised on to secure all three points by seeing out the game in comfortable fashion. 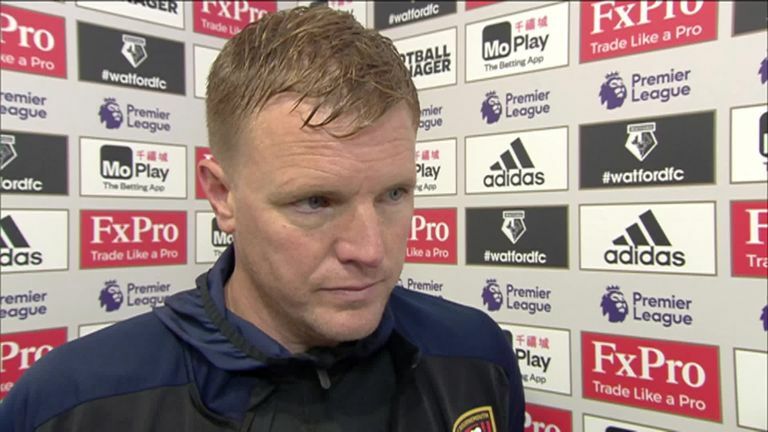 Eddie Howe: "We're very pleased with the result. Really tough place to come, Watford have been in very good form themselves this season. It wasn't the perfect performance, but it was efficient, and we got a great result. "I think we're capable of beating anybody when we're on the top of our game. I don't think we were on top of our game today, so that's good because there's room to grow and improve. "But the results show we are in a really good place at the moment, a great position in the league, and we need to keep our feet firmly on the floor and keep pushing. "Hopefully they won't [start talking about us]. We like to stay very much in the background and as underdogs. We'll just go about our work in a very controlled way and not get ahead of ourselves." 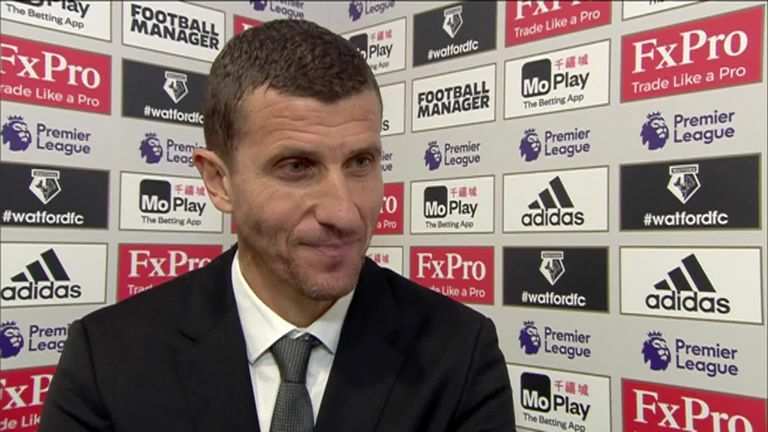 Javi Gracia: "Today was a bad day. A strange afternoon. We started trying to do our best, but from the beginning, I think they played better than us, and after we play with ten players, it was very difficult for us. "The players kept going in the second half with a good attitude, but it was very difficult. "Today is the first game where we feel we're not at a good level. In the rest of the games, we have competed very well. "Today, it has been different and we need to know that to improve for the next game. I'm sure the players in the next game will have a better performance." 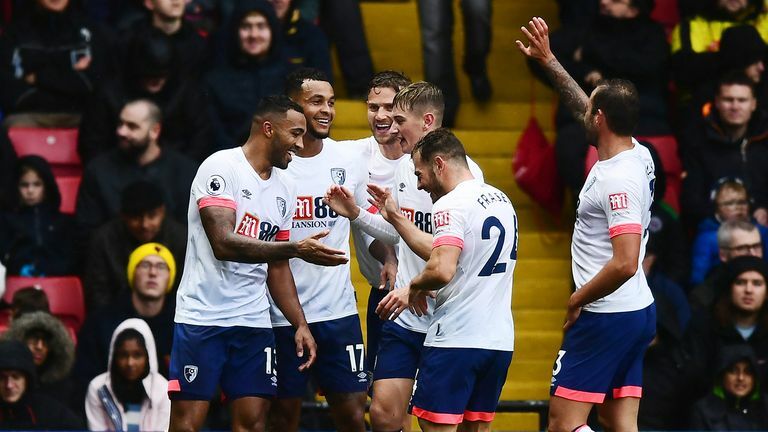 Bournemouth's 4-0 win at Watford is their biggest ever away top-flight victory. Bournemouth are just the second different side to beat Watford by 4+ goals in a Premier League match at Vicarage Road, after Man City (0-5 in May 2017 and 0-6 in September 2017). Since returning to the Premier League in 2015-16, Watford have been shown more red cards than any other side in the competition (13). Bournemouth have kept a clean sheet on the road in the Premier League for the first time since January, ending a run of nine without one. Watford have conceded 19 penalties in the Premier League since the start of the 2015-16 season; only West Ham (22) have given away more. Bournemouth have scored four goals away from home in a Premier League game for only the second time, and first since August 2015 (4-3 at West Ham). Bournemouth's Josh King has scored 34 goals in the Premier League - only four Norwegians have scored more in the competition (Ole Gunnar Solskjaer, Steffen Iversen, John Carew and Tore Andre Flo). Bournemouth's David Brooks has scored in successive league games for the first time in his career. It could have gone to Wilson or Brooks, but King was the standout player for his two goals and winning the penalty that saw Watford go down to ten men, which massively changed the game. The ex-Manchester United striker placed his spot-kick perfectly, keeping a cool head to send Foster the wrong way, while he did well to connect with Wilson's cross for his second. King's all-round play was superb and he was the focal point of most Bournemouth attacks, while also feeding balls to the likes of Wilson, Brooks and Fraser. He now has scored four goals in eight Premier League games - two behind Eden Hazard - and one behind Sergio Aguero, Harry Kane, Aleksandar Mitrovic and Glenn Murray. Watford’s Nathaniel Chalobah didn’t even make it off the bench, while Will Hughes failed to impress in the 4-0 defeat as he was brought off in the 55th minute. For Bournemouth, Wilson bagged his third goal in eight Premier League games, while Lewis Cook enjoyed a good game in the centre of midfield in what was only his second top-flight start of the season. Bournemouth host south-coast neighbours Southampton at the Vitality Stadium on October 20 (3pm kick-off) when the Premier League returns after the international break. Watford travel to Wolves on the same day at Molineux. That game will also get underway at 3pm.